So the lovely 'turkey boys' are now fully recovered from their bout of chicken pox (or rather fowl pox!) and are looking much finer. They are growing very quickly and eating an enormous amount! I have no idea where they put it, they are like starving teenagers. This is Spock and Humphrey is looking headless in the background! I would imagine he is preening himself. Since taking these pictures their tiny house has been enlarged slightly but they tend to roost on the top of it under the pine trees and only take shelter if the weather really is awful! They are now quite strong but I managed to re-clip their wings the other day as they were looking rather flappy. It was a bit of a battle getting a grip on them without them hurting themselves, but once I had them with their heads under my left arm, they stood quite still and calm. At one point one of our kittens happened to wander into the pen whilst I was in mid-clip, and then Humphrey made a big hissing sound! I'd never heard that before. The kitten was quickly removed before Spock decided to peck at it. I am hoping to gather some more materials for the turkey house so we can build it bigger but I think it will be fine for now. I have put straw inside and their food is undercover also, they seem quite happy with the arrangement for now. 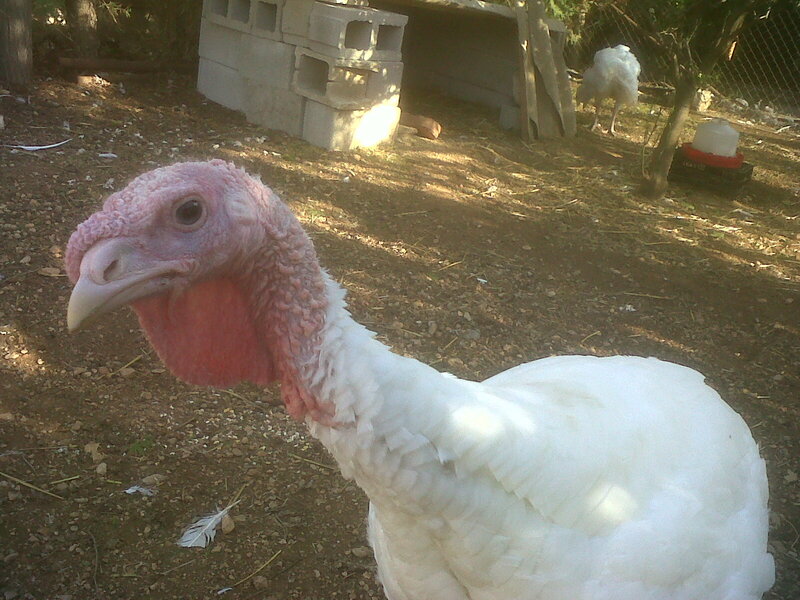 I have no idea how two male turkeys compete or behave together when they are fully grown, but there are no females around to impress, so I am hoping they will behave themselves. The weather today is very windy and the temperature has dropped considerably, it is quite chilly inside the house today, probably marginally warmer outside. We have de-flea'd Ruffa (our boxer) so that he can start to come inside in the colder weather. Boxers tend to be sensitive to temperature and I noticed the other night he was curled up tightly in a little ball to try to keep warm on the sofa outside. So his indoor bedding is washed and ready for him to curl up on for the chillier nights to come.